There is an episode in my childhood I will never forget. We were at a church function and the boys were picking teams for a basketball game. I was tall for my age, about twelve at the time, and being born in Indiana, the basketball capitol of the world, you might think I slept with a basketball, ala basketball Jones. Nothing could be further from reality. I couldn’t dribble except while eating and I threw the basketball like a baseball, and usually over the backboard. I was picked dead last-I think I heard the comment “I guess we’ll take him”. Ouch. That hurt a lot. That night I made it my goal to never ever again be the last person picked by a team forced to take me. I bought a basketball and headed to Park Lafayette on the west side of Indianapolis every single day. I spent four to five hours a day or more watching players, playing with those who were bigger and better than I was, practicing the fundamentals of dribbling, jump shots, bank shots, free throws, blocking out and rebounding (the NBA might find these fundamentals useful). In two short years I was a starter on the grade school basketball team and I continued working to become a starter in high school. I had the size and the skills but I had done nothing to discover or develop then into ability. I had to grow into my given skill set. When I was younger my parents and friends noticed I was always tapping on things, tapping to music, tapping to anything that had a beat. So one Christmas they bought me a blue metallic Ludwig snare drum. I played that thing in the basement every day until bedtime. In high school I decided to buy my first drum set, a used 5 piece Pearl set. 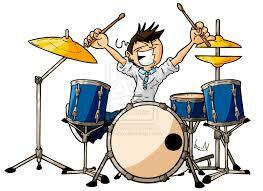 Like with basketball I soon discovered that having the right equipment didn’t make me a drummer. But the gift of rhythm was already inside me so all I needed to do was practice, study and observe others who were better than I was. One year after purchasing the set I was in a Christian band and playing weekly around the mid-west. In both instances, I did not create my own talent or gifts, but rather I developed that which was already inside me and did what I could to bring it out for my use and enjoyment. I have seen seven foot men who couldn’t hit a layup and I’ve seen kids with 12 piece drum kits who couldn’t keep a straight 4/4 beat. We each have to discover our gifts and develop them through practice and patience. The New Testament speaks about spiritual gifts we all receive when we come to accept and follow Christ. We are each given differing abilities so that we can serve each other in the body of Christ. 2 Timothy 1:6 says that we are to “fan into a flame the gifts that we have received”. Accepting Christ and deciding to live your life for Him does not make you a minister, a Bible scholar or a small group leader anymore than buying a Bible makes you a believer. Some in the body have not yet learned this. In working out our salvation with “fear and trembling” there is a learning process that must be accepted and endured. God does not give us developed spiritual gifts, but rather the seeds of these gifts that are ours to cultivate or fan into flame. 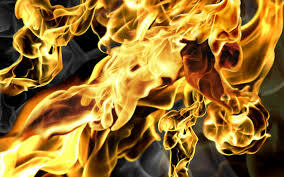 There is something about fire that is captivating. I can sit around my fire pit at night and just get lost in the flames-something just draws me in and holds my attention. It is alive, ever glowing but changing color, always changing while remaining the same. The properties of these gifts God has placed within each of us should have that same affect when others see them at work in our lives. They should be compelling and inviting, showing the love and the way to Christ, opposed to the approach that much of today’s church has taken through Bible weaponry and hatred. But these gifts will remain untapped and dormant if we ignore them or rely on our favorite TV evangelist to somehow reach through the screen and zap us into super Christians through miracles prayers and a generous seed offering. Jesus’s parable of the talents comes to mind here. Three individuals were given talents based on their respective abilities. Two of the three fanned into flame their gifts and doubled them while the one buried his deep with no thought or intent of growth. The two were deemed good and faithful-the one, not so much! What are we doing to fan into flame that which God has planted in us upon our election? Can we keep a beat or connect on a jumper, or would we be the last one picked because we have no apparent skills? While age has decreased my ability to jump or ball the way I once did, spiritual gifts do not decay with age and remain eternal for the benefit and edification of the body of Christ. God teach us to develop what you have richly given. This entry was posted in Uncategorized and tagged basketball, Christ, Christianity, development, drummers, fan into flame, Jesus, love, parables, practice, Spiritual gifts, talents. Bookmark the permalink.